Denver • The 38-year-old journeyman catcher looked to his left and spotted his Milwaukee Brewers teammates spilling out of the dugout. Erik Kratz then looked straight ahead and saw his reliever standing alone. So he took off for Josh Hader to give him, “the biggest hug. ... Because you celebrate all your celebrations. Because you never know if you’re going to get another one,” Kratz said. 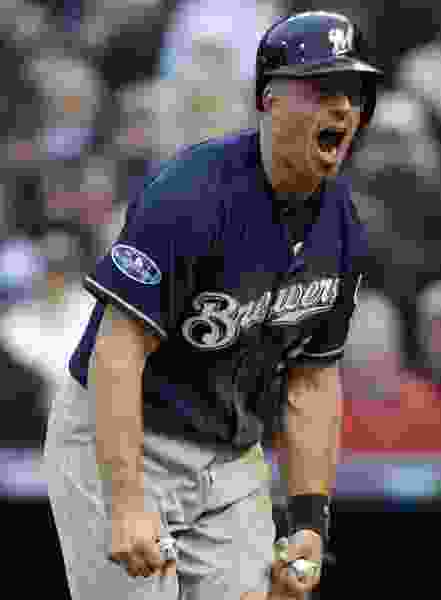 Wade Miley pitched masterfully into the fifth inning before turning it over to a lights-out Milwaukee bullpen , Kratz kept up his torrid hitting and the Brewers beat the Colorado Rockies 6-0 in Game 3 on a cool, misty Sunday to sweep their NL Division Series. The Brewers have won 11 straight dating to the regular season and advance to their first NL Championship Series since 2011. They will play the winner of the Dodgers-Braves series, starting Friday at Miller Park — by the time that game starts, it will have been nearly three weeks since Milwaukee lost. No surprise, after the season he had. But then the team started chanting the same thing for Kratz. “That might be the champagne talking,” Kratz cracked. With manager Craig Counsell making all the right moves, Milwaukee’s pitching staff held Nolan Arenado, Trevor Story and the bruising Rockies to a combined two runs and 14 hits in the series. Of the 28 innings in the matchup, Colorado scored in only one of them. “The story of the series for us was certainly our pitching,” Counsell said. It’s been that way for a couple weeks now, including Milwaukee’s 3-1 win over the Cubs at Wrigley Field last Monday in the NL Central tiebreaker. The next day, the Rockies outlasted the Cubs 2-1 in 13 innings to win the wild-card game. Making his postseason debut, Miley toughed the elements — he wore short sleeves when the temperature was 46 degrees — and was even tougher on Rockies hitters. The wily left-hander allowed three hits over 4 2/3 innings. A procession of five Brewers relievers allowed one hit the rest of the way. With two on, Hader got Ian Desmond to fly out to end the ninth and start an on-field celebration. The first one to greet Hader was Kratz, who made his second postseason start and finished 3 for 4 with a double. Acquired from the New York Yankees in May for a player to be named, Kratz is making quite a name for himself in the playoffs. He went 5 for 8 in the series. Orlando Arcia and Keon Broxton hit back-to-back homers in the ninth off Wade Davis to make it 6-0 and end any sort of drama. Jesus Aguilar had a solo shot in the fourth off German Marquez that Counsell sort of predicted. Granted, it wasn’t with men on base. But it was still big and gave the Brewers a 2-0 lead. That was more than enough against a Colorado offense that was shut out twice in the series and hit .146 against Milwaukee’s stingy pitching. Colorado’s three All-Stars — Story, Arenado and Charlie Blackmon — finished the series with a combined five hits. This is how well it went for the Brewers on the drizzly day: They scored twice in the sixth without a hit — one on a balk and another on a wild pitch, with Kratz lumbering home for the second run. The 31-year-old Miley endured a bumpy season that saw him suffer a strained groin in March and later miss two months with a right oblique strain. He bottled up the Rockies with a cutter, curve and an effective change. Marquez went five innings and allowed two runs before being lifted for a pinch-hitter. He got the start over Denver native Kyle Freeland, whose 2.40 at Coors Field this season was the lowest mark for a starter in franchise history.